Objective Minimally invasive surgical necrosectomy and endoscopic necrosectomy, compared with open necrosectomy, might improve outcomes in necrotising pancreatitis, especially in critically ill patients. Evidence from large comparative studies is lacking. Design We combined original and newly collected data from 15 published and unpublished patient cohorts (51 hospitals; 8 countries) on pancreatic necrosectomy for necrotising pancreatitis. Death rates were compared in patients undergoing open necrosectomy versus minimally invasive surgical or endoscopic necrosectomy. To adjust for confounding and to study effect modification by clinical severity, we performed two types of analyses: logistic multivariable regression and propensity score matching with stratification according to predicted risk of death at baseline (low: <5%; intermediate: ≥5% to <15%; high: ≥15% to <35%; and very high: ≥35%). 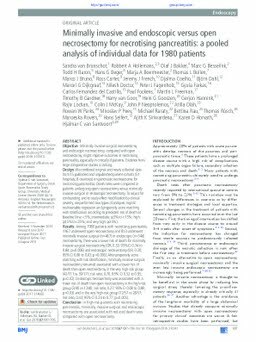 Results Among 1980 patients with necrotising pancreatitis, 1167 underwent open necrosectomy and 813 underwent minimally invasive surgical (n=467) or endoscopic (n=346) necrosectomy. There was a lower risk of death for minimally invasive surgical necrosectomy (OR, 0.53; 95% CI 0.34 to 0.84; p=0.006) and endoscopic necrosectomy (OR, 0.20; 95% CI 0.06 to 0.63; p=0.006). After propensity score matching with risk stratification, minimally invasive surgical necrosectomy remained associated with a lower risk of death than open necrosectomy in the very high-risk group (42/111 vs 59/111; risk ratio, 0.70; 95% CI 0.52 to 0.95; p=0.02). Endoscopic necrosectomy was associated with a lower risk of death than open necrosectomy in the high-risk group (3/40 vs 12/40; risk ratio, 0.27; 95% CI 0.08 to 0.88; p=0.03) and in the very high-risk group (12/57 vs 28/57; risk ratio, 0.43; 95% CI 0.24 to 0.77; p=0.005). Conclusion In high-risk patients with necrotising pancreatitis, minimally invasive surgical and endoscopic necrosectomy are associated with reduced death rates compared with open necrosectomy.